The Mayan weaver was kneeling on the ground in front of her loom weaving complex patterns. I stood above her mesmerized, watching her fingers flying across the warp, one row, then another and another. How did she do that, so deftly, without consulting a design? How did she keep track of all those colors? The backstrap (body tensioned) loom is one of the simplest looms used by indigenous weavers. The backstrap refers to a strap that fits around the back of the weaver’s midsection. In the front, the strap is attached to the loom’s breast beam. The warp is then usually strung between a stationary object and the breast beam, and the tension on the warp is set by the weaver leaning against the strap. Backstrap looms vary in different parts of the world, in their construction, whether the strap is made of leather or fabric, and the warp is continuous or discontinuous, and the particulars of the position of the weaver relative to the loom. 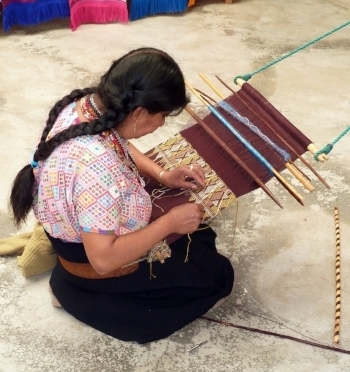 In Central and South America and in isolated pockets in Asia, most weavers either kneel or sit in front of the loom, the back beam is tied to a tree, or a pole. They control the tension on the warp is obtained by leaning back. Of all the versions of the backstrap looms, this one is by far the easiest one to transport and set up. In southeast Asia, the majority of backstrap weavers usually sit upright, legs outstretched, feet braced against the back beam. In some places in Asia, the back beam is held firmly in place. In Bhutan, for example, it’s part of a frame that is anchored to a wall. In Indonesia, the beam fits between a pair of fixed supports. However, in Laos and Vietnam, as ion Central and South America, the back beam is not supported. Unlike South and Central America, where the back beam is tied to a tree, in Laos and Vietnam the unsupported beam is held in place by the weaver leaning backward, her feet braced against it. For narrow warps, such as belt looms or in tablet weaving, there’s no need for a back beam. The warp threads are knotted together and the knot is tied to a stationary object. But in cases where the finished fabric is wider, a device that spreads out the warp threads helps maintain an even tension. In most cases the back beam plays that role. But in the Ainu looms in Japan, a bamboo reed, hanging behind the heddle bars both keeps the order in the warp threads and prevents them from bunching up. Similarly to many Asian backstrap weavers, the Ainu weaver sits with outstretched legs. But instead of bracing her feet against the (nonexistent) back beam, she rests her feet against the reed. In Japan and Korea, some of the looms are transitional, a hybrid between a back strap loom and a single harness loom, where the entire frame is stationary. As in traditional backstrap weaving, the weaver leans against a strap for tensioning. But unlike most backstrap looms, where sheds are created by raising and lowering heddle bars, in transitional looms, the back beam is part of a stationary frame, where the harness, which creates the shed, is operated through a cord that is attached to the weaver’s foot. Whichever technique back strap weaver uses, it’s clear that it is very hard on the body. A Bhutanese weaver I met at a weaving conference more than a decade ago, mentioned that the pain in her back and outstretched legs can become unbearable, limiting her hours of weaving. As I watched the Mayan weaver kneeling on the ground, advancing row by row, and she created a gorgeous huipil, I wondered how long she could keep going—her back must have been killing her. Ann Hecht, The Art of the Loom: Weaving Spinning & Dyeing Across the World, University of Washington Press. Eric Broudy, The Book of Looms: a History of the Handloom from Ancient Times to the Present, University Press of New England. H. Ling Roth, Studies in Primitive Looms, Robin & Russ Handweavers. Andrew Hunter Whiteford, Herbert Spencer Zim, and Owen Vernon Shaffer, North America Indian Arts, St. Martin’s Press.